I made this a day or two after I made this brown rice bowl and needed to use up the extra rice I had leftover. Normally I make fried rice but we had just recently had some, so I made some soup and called it dinner. And oh, it was good and simple….and very economical! Just root around your fridge/cupboard for those wayward items you don’t know what to do with and throw ’em in a pot. This is pretty much how many of our meals come into being since I hate letting things go to waste. 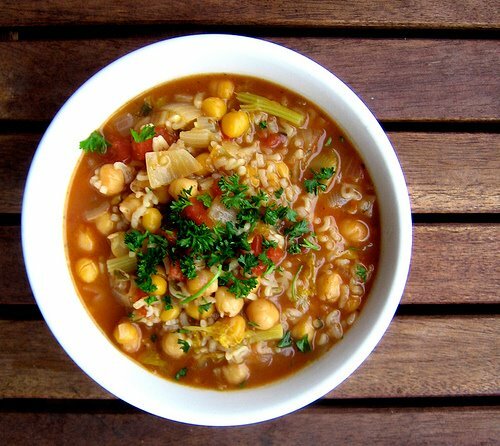 The soup has rice, beans and even some alphabet pasta, so it’s definitely hearty and filling, and the salsa and chilies help to give it a nice kick for a perfect weeknight meal. In a large pot, heat up olive oil over med-high heat and add in onion, garlic, and celery. Let them get soft and translucent and then add in the salsa and the spices. Add in rice, chickpeas and pasta and cover with vegetable stock, adding more stock if needed. Let simmer until the pasta is cooked through. Taste and add in salt and pepper if needed. Ladle into bowls and sprinkle with parsley. Cheap and delicious! Nice photos! Do you make your own stock or use bouillon? I just came across another bean soup from another Canadian just a second ago. Soup is the perfect way to introduce these into your every day healthy diet. It is always great to have an adaptable recipe. This is tthe perfect sort of thing to clear out the pantry and vegetable drawer! Thanks. There are thunderstorms in my area today and this bowl of soup looks like the ticket on a day like today! I hate letting go to waste too. But you did make great use of things, as well as flavorful. Yummy looks good and hearty… and simple! I love chickpeas! My mom loves chickpeas so I’m always on the lookout for things to cook that include them. This sounds like a great recipe to tyr. Sounds delicious. I’m always looking for filling soup recipes. Thanks for sharing! This sounds wonderful! I would love anything with chickpeas in it, I think! this looks sooo delicious! chickpeas are one of my favorite things in the world. this soups looks good for my soul. Looks delicious! I love that first photo. I wish I could just randomly come up with yummy things like this. You come up with the best combination of wayward item meals…I have to admit that I tend to leave things in the fridge far too long and they go bad…when I root around in the fridge, the stuff I find goes straight to the compost bin. I could have used this delicious soup this past week when I was sniffling away as a result of a lingering cold. This sounds nice and healthy and it looks good! Oh that looks just delicious! I loves me a good soup, especially when its using up a bunch of junk from your fridge! Kickpleat, I don´t know enought about Portugal, sadly, but if you´re considering crossing into Spain drop me a line and I´ll show you around Madrid. Recommended: Buçaco, Marvao, Porto, Lisbon of course, Evora (particulary the quejadas). Watch out because all the little appetizers they serve are charged later, so if you don´t want them, say so before they hit your table. JC, for this I did just a stock cube! But normally, I do have homemade stock in the freezer (just not this time). Bellini Valli, beans are so versatile! Tara, I always think of soup as infinitely adaptable! bummer on the showers, but hooray to the soup, sarah! Hag, you know me, i love simple & hearty things. Mrs. L, chickpeas are great. I hope your mom loves this. Chickpeas are so great, Maris. Thanks Joy, soup is good for the soul. Thanks eatme! Oh, I think you could…trial and experimentation is always fun! Ah shucks, Bijoux! I'm getting the sniffles, so maybe I should make this again! Hope you are doing well again! Oh Lobstersquad, it won't be for a few years yet, but when I do hit up Spain I'll come knocking!! I just found your blog, and it’s beautiful! Great looking soup, by the way. 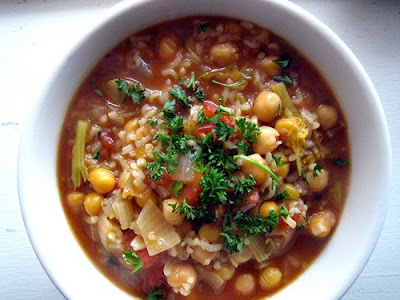 I love chickpeas and can’t find enough ways to prepare them. Chickpeas in *anything* is good as far as I’m concerned, so dish up that soup and let’s get on with it! Thanks Helen, I feel the same way! Daily Spud, i couldn’t agree more. This look great, I love all of these vegetarian recipes that you have been posting. And now that the weather has changed I may need soup recipes again. Katerina, you mean the weather is changing for the better????? Well, I’m keeping my fingers crossed!